Afraid to love you and be hurt again…. How long will we last together? 1 month, 1 year, 10 years or until death do us part? What if I give you my all, will I lose it all? I don’t want my heart broken again, not again ~ oh lord! Should I give my wholeness again? Should I hold up my deep emotions? Should I keep all my love within myself and just share a bit with you? Are you worth it? Asking from a place of pain and confusion. I whisper… “I love you” ~ while you still sleep. I question, Should I give you my all? Should I give you my whole? Should I give you the best of me? Should I hold something back from you? Would I lose it all? Would I break my heart again? Because, it hurts ~ don’t you get it? Can you show me who hurts? My neediness and emptiness let me see I hurt. I want infinite source to show me. I felt it, I saw it ~ every time I separated myself from oneness. I felt it, I saw it ~ every time my relationships ended, I separated from OUR wholeness. From separation ~ I feel pain, I feel hurt and I feel broken. From oneness ~ I feel freedom, I feel joy and I feel love. Yes, why not ~ why not give my all and whole to our wholeness? Yes, why not ~ why not live every minute where time does not exist and the only thing I see is my heart and yours connecting with eternity beyond our minds, bodies and souls. Yes, why not ~ why not trust that I am blessed with infinite abundance of love, that I am always loved, ready to love and be loved. Yes, why not ~ I love you… No matter how long or how short our journey is, I will be whole and you will experience the fruit of my wholeness. I smile ~ I am not afraid to love again, I am whole and so it is! In my journey of attracting amazing lovers into my life, I had let questions lead my life ~ questions that were coming from a place of separation, defense and planning my next move always acting from a place of readiness. 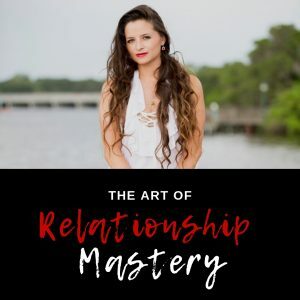 I have had great relationships where I learned so much about MYSELF and in each relationship I thought I have made it, that I had found true love ~ and each time the relationship ended I was giving less and less of me to myself and my partners. Until one day, a spring day where I was so afraid to fully love my present lover, I was afraid that I will have to let him go one day and my heart would be broken all over again so I withheld a lot. How can you be in a relationship when you withhold a lot of yourself and don’t give yourself fully? You may ask. I have done it, I have experienced, I have lived the pain, and let me tell you ~ it does not work! Love… True love is part of us and we are part of love. I have learned that the moment we separate ourselves from our wholeness and dissociate from our oneness is when we experience pain and suffering. Love fully, be fully present in love, give all your love and beyond ~ Start living from a place of wholeness, fulfillment and oneness.